Yours received today and while I have a few minutes will answer. The last time Lea and Bob and John were here Lea said she was thinking about going to Rockport to stay with you when Bonnie gets home from the hospital. I would like to come and if the baby goes over as long as Debbie did, I may be able to come out, but can’t promise anything. Since I am Chairman of Missionary Education I have a responsibility at the School of Mission July 5th to the 11th. Lea and Bob are coming here the 28th of this month to play bridge. We are entertaining the Kentland Bridge Club and the Kennys can’t come, so Lea and Bob are coming to substitute for them. We will talk about the trip to Rockport when they come the 28th. Lea recently spent a week or so with one of her cousins (Betty) when her baby came and I think that was what gave her the idea to come and help Bonnie. I am hoping I will get a chance to come out before then, but haven’t any definite plans at this time. We were in Kentland the last Sunday in February—Dad gave a program or rather talked to the high school class at the United Methodist Church about drugs. After the morning worship service we took Mrs. Myers to the parsonage and had dinner with the McClures. She really enjoyed getting out. She doesn’t get out very much anymore. About the only going is to get her feet worked on. The hairdresser goes to her apartment and does her hair so she doesn’t have to go out for that. I just wish she would go to a nursing home, but since she is so set against it, there is not much to do about it. I can understand why she wouldn’t want to go to one, even though it would be better for her physical condition to be where she could get some care. In the evening we went to Johnsons for bridge club. The Kenney’s ate at our table and told us Tommy has quit college—he had transferred from Indiana State University to I.U. He apparently didn’t do anything for a long time but just loaf around. Now he is working for either the University or the City on a trash detail. Sounds like quite a comedown for one who had a silver spoon in his mouth—like an unlimited checking account and a car of his own. He also quit the Catholic Church. Phyllis said that he wanted to go to Europe this summer and she wants him to go and get it “out of his system.” From everything I know about how he was allowed to grow up, I think he had no parental guidance and I think that was one thing he probably needed as much as anything. I think Art and Phyllis thought if they gave those boys everything they wanted and didn’t make them do anything they were being good parents. Bill is going to Herron Art Institute in Indianapolis and from what I have seen of his work he is quite good. The Logans were here this evening. They came down once a year for check-ups—they are Dad’s only patients, outside of Purdue Students. Dad takes care of them for their yearlys and Dr. L., takes care of our teeth. We have had them here for dinner before, but this time they insisted they take us out for dinner, so we ate at Sarge Biltz. In spite of all the new places to eat here in Lafayette and W. Lafayette, that place holds its own. I suppose a good reputation for good food is hard to beat. The Logans were talking about Tom Kenney. We were surprised that Art hadn’t good to pieces, like he always did when anything went wrong with Tom, but he and Phyllis were both acting quite casual about the whole thing. Dr. L. thinks they are just putting on a good front. Dr. Logan goes to the drug store often and he says Art talks about Tom all the time and about what he is doing. At Christmas time, he went to New York to spend the time with a girl friend. Phyllis has a brother who is a lawyer and the plans were for Tom to go into his uncle’s office when he finished law school. Phyllis keeping saying that she thinks Tom will go back to school next semester. I still think his greatest problem is his parents. Phyllis said they never did tell him what to do, just let him do his own deciding. Sounds like you had a big day with the Bishop and other ministers. Wish I could have been there. Also the Town Meeting sounded interesting. 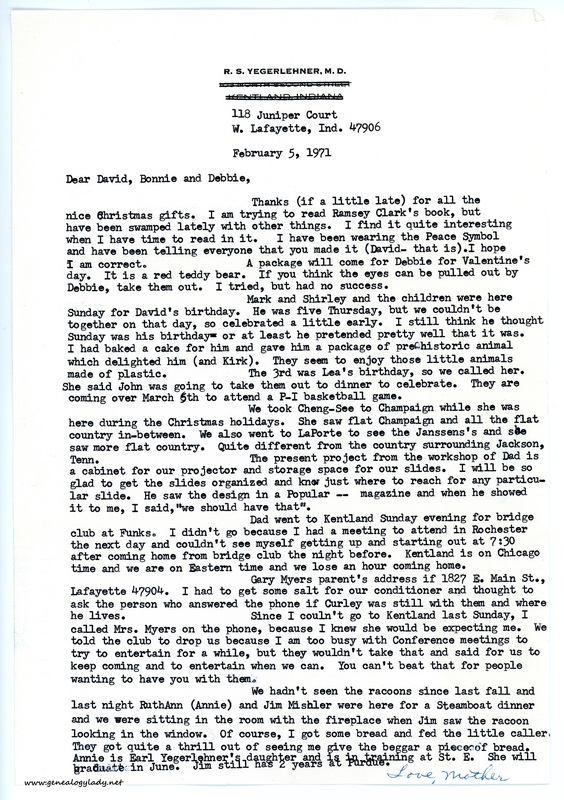 When I get to Kentland, I read your letters to Mrs. Myers and knew from them that you were planning to come to Indiana for Christmas. While reading and catching up on news from you I had a thought. Why don’t you make a carbon copy when you write to her—using this kind of paper and send me a carbon each week. The only extra effort it would require would be an envelope and a six cent stamp. How about? If you will send me the carbons (copy), I will write to you each week. Fair deal? The Logans left early because the weather forecast is for snow and they didn’t want to get caught in bad weather on the way home. The weather here this winter had been pretty good, but in listening to the weather from all over the country, sounds like you have had plenty. for some time. And also it will be good to have all the slides in one place. It is a neat little cabinet and he is about through finishing it. It will probably take me as long to get the slides sorted and put away as it took him to build it. We are going to LaPorte (Janssens live there) Sunday. I have been asked to give a program on Missions at their church on Sunday evening. We are going in time to have dinner with them, also attend morning worship service with them. I gave the program to a Guild group last night. Our Conference office has procured a film strip that does a pretty good job of covering the work of the United Methodist Church in North Indiana Conference and Missions around the world. We have plenty of information if people would just bother to inform themselves. I am afraid too many of the people who go to church do not know what it is all about. Maybe I shouldn’t feel that way, but last night I asked how many had a prayer calendar and some of the other publications which women in that group should be reading and they looked at me like I was speaking a different language. I will say this for them, they pay their pledge to missions, but from what I hear, some of them ask, “where does our money go?” I told them last night in the literature I had with me was all the information anyone needed to know where their money goes. 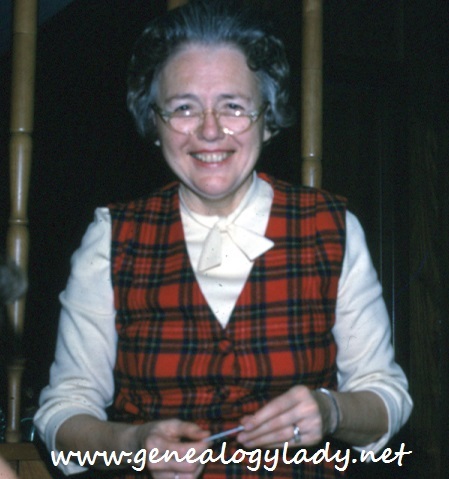 Since I am Chairman of Missionary Education, I work with the Conference Missionary Secretary and he asked me to itinerate a missionary we have listed in our North Indiana Directory. He is Lawrence Thompson and this year he is working for the Board of Missions. in N.Y. office. He has been a missionary in Japan and will be going back to Japan this summer. He is going to be itinerated in Logansport District and Lafayette District. He will be a guest here with us from April 30th to May 3rd. He will fly back to New York the morning of May 3rd. He will speak in our church at the morning worship services May 2nd, and at a church on the south side of town in the evening. He will be in Indiana 10 days. Think about the proposition I made about sending me the carbon copies. Have been looking for Don’s address, but can’t find it. Will get it from his sister Annie Mishler—she is taking training at St. E. and her husband is in school at Purdue. Will call her soon and get the address.—Just looked and looked in my filing cabinet for my Christmas list and couldn’t find it under C where I always file it. Resumed this letter and happened to see a clip board that has been on my desk since Christmas and the thought suddenly occurred to me that my missing list wasn’t missing, but just at my finger tips. The address is Rev. Donald Yegerlehner, 2305½ Sand Point Road, Ft. Wayne, Ind. 46807. I think he has the title of Rev. After graduating from Purdue with a 6 point (the highest) he went to Minnesota for a year or two and took Theology. He is now doing social service with a church in Fort Wayne. Received a letter from Louise recently and she was wondering if we could meet in Switzerland. I am afraid our schedules will not mesh. It would have been fun to be together and show them around to some of the places we are familiar with, and have them meet some of the distant cousins. Thank for all the information about your activities. Glad Debbie liked her Teddy. 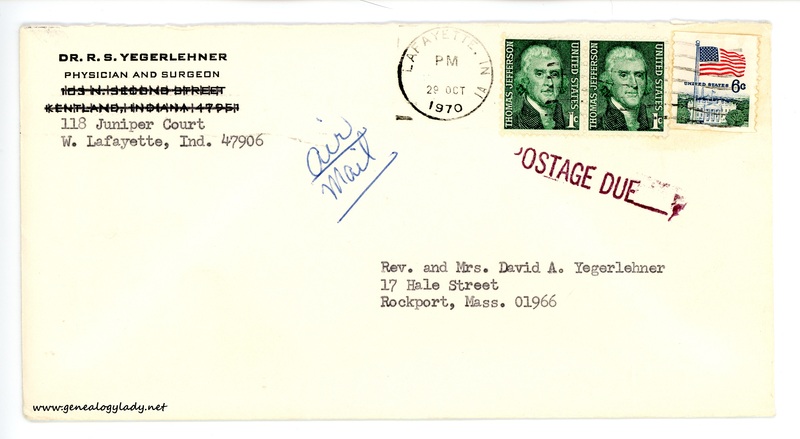 This entry was posted in Genealogy, Yegerlehner and tagged 1971, David A. Yegerlehner, genealogy, Gladys R. (Foster) Yegerlehner, Indiana, Kentland, Lafayette, Massachusetts, Methodist Church, Phyllis (Merrill) Kenney, Roscoe S. Yegerlehner, Ruth M. Myers, Thomas Arthur "Art" Kenney, Thomas H. Kenney on December 23, 2017 by Deborah Sweeney. Since I sent your birthday gift with Bonnie’s, this will just be words. Have been rather busy since coming home, and having Mark’s three here one week kept me occupied that week, haven’t had much time to write but will hope to catch up on things when we come in Oct. 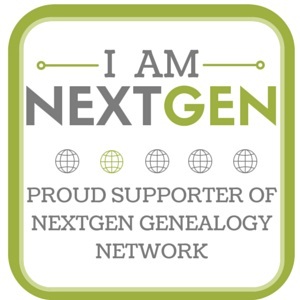 I have to attend a regional meeting in Oct.-2-3-4 in Chicago. Also should attend a Conference Meeting (Division of Christian Outreach – of which I am a member) on the 5th so am not certain right now whether we will get to start on the 6th or 7th. Will try to get off on the 6th – If I can find time to get things ready for Dad. He thinks we won’t be able to come. One of the M.D.s at the Health Center suffered a broken hip and won’t be back to work until Nov. 1 so he thinks it wouldn’t be right for him to try and take off in Oct. We shall see. Looking forward to seeing you in Oct. Don’t forget to write to Mrs. Myers. It means so much to her to get your letters. 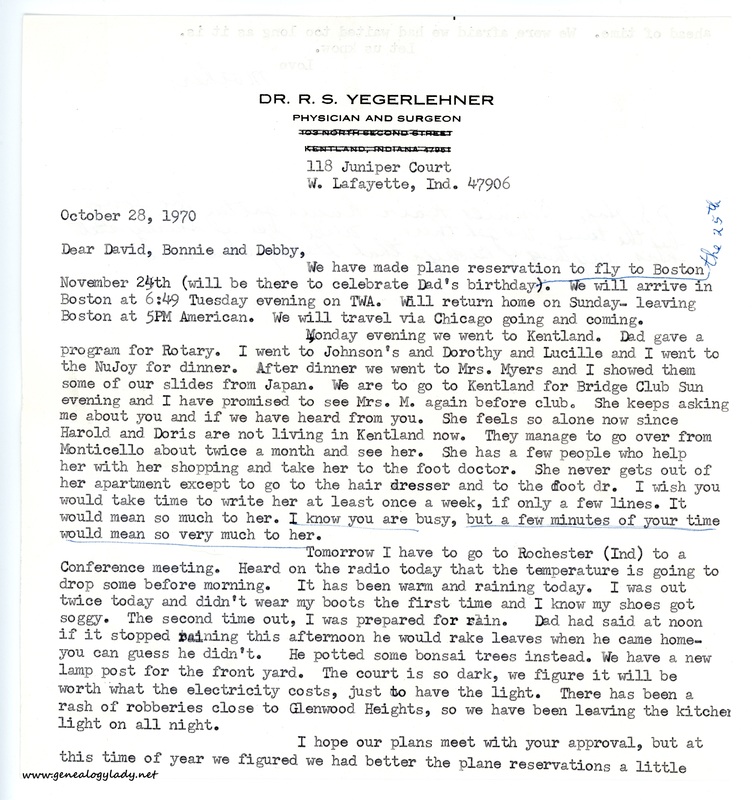 This entry was posted in Genealogy, Yegerlehner and tagged 1970, David A. Yegerlehner, genealogy, Gladys R. (Foster) Yegerlehner, Indiana, Lafayette, Mark A. Yegerlehner, Massachusetts, Methodist Church, Rockport, Roscoe S. Yegerlehner, Ruth M. Myers on October 12, 2017 by Deborah Sweeney. The check is for both of you. Will try and get David’s card out before his birthday. Have been quite busy since coming home, but did have a most enjoyable trip. Met a young girl who was coming to U.S. last year. She was on the staff of U. of I. last year – (Sept ’69 to June ’70) and is now returning to Japan. She couldn’t be back in Tokyo when we were there but her Mother and a sister and husband (Dr. Yamada – with Univ. of Tokyo) entertained us one day and evening. We attended Kabuki theatre together – 11 am to 4 pm – then went to a Japanese dinner. 10 courses. Quite an evening. We took pictures while in the restaurant. If I can think about them, will bring them along. 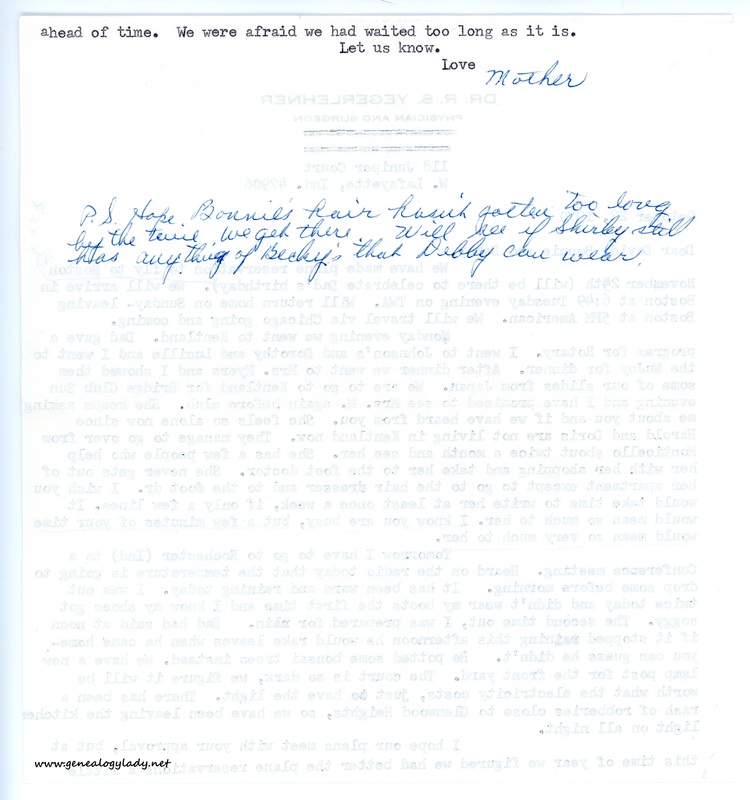 This entry was posted in Genealogy, Yegerlehner and tagged 1970, David A. Yegerlehner, genealogy, Gladys R. (Foster) Yegerlehner, Indiana, Japan, Lafayette, Massachusetts, Rockport, Roscoe S. Yegerlehner on October 7, 2017 by Deborah Sweeney. I am enclosing a check for your wedding anniversary. Sorry to be so late with it, but I was struggling with an infection (kidney) last week and attending Conference, so between sessions I would come home and do nothing I didn’t absolutely have to do. The enclosed are the “things” which our Section on Social Witness tried to get before the Conference. One didn’t get out of the Legislative group and the other died a quick death, and all for $5.00. When Conference was about to close a man asked for permission to speak and said this session did not deal with any of the controversial issues of today. I said to myself, “well we tried.” The Bishop replied that he thought many important matters had been dealt with. He said in his sermon at the ordination service (which I did not attend) he thought he had dealt with the issues which are vital today. Of course, we didn’t go on record as having dealt with issues. However, there is something in the pre-conference minutes which heals with military spending and the creation of a task force to study same and to get some meetings going in which military spending will be discussed. 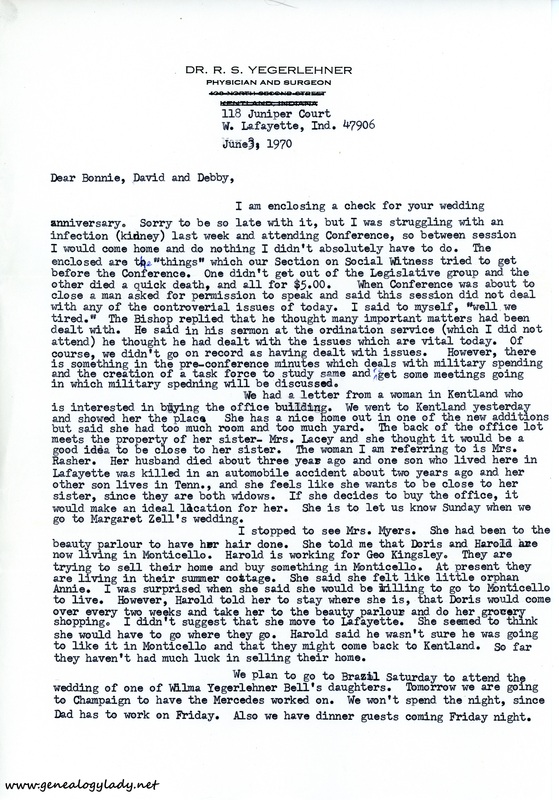 We had a letter from a woman in Kentland who is interested in buying the office building. We went to Kentland and showed her the place. She has a nice home out in one of the new additions but said she had too much room and too much yard. The back of the office lot meets the property of her sister—Mrs. Lacey and she thought it would be a good idea to be close to her sister. The woman I am referring to is Mrs. Rasher. Her husband died about three years ago and one son who lived here in Lafayette was killed in an automobile accident about two years ago and her other son lives in Tenn., and she feels like she wants to be close to her sister, since they are both widows. If she decides to buy the office, it would make an ideal location for her. She is to let us know Sunday when we go to Margaret Zell’s wedding. I stopped to see Mrs. Myers. She had been to the beauty parlour to have her hair done. She told me that Doris and Harold are now living in Monticello. Harold is working for Geo. Kingsley. They are trying to sell their home and buy something in Monticello. At present they are living in their summer cottage. She said she felt like little orphan Annie. I was surprised when she said she would be willing to go to Monticello to live. However, Harold told her to stay where she is, that Doris would come over every two weeks and take her to the beauty parlour and do her grocery shopping. I didn’t suggest that she move to Lafayette. She seemed to think she would have to go where they go. Harold said he wasn’t sure he was going to like it in Monticello and that they might come back to Kentland. So far they haven’t had much luck in selling their home. 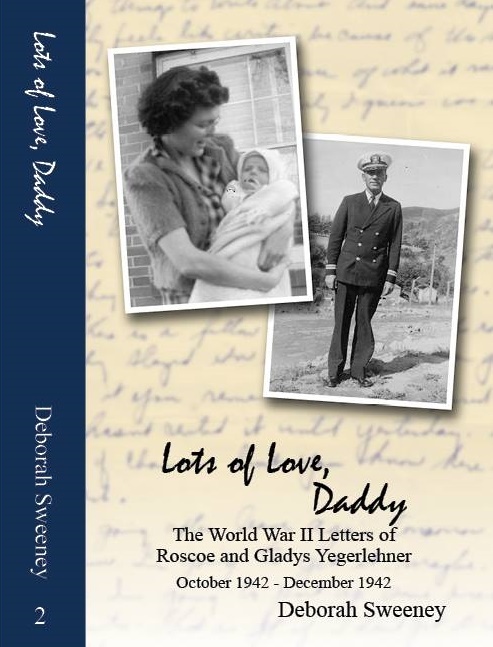 We plan to go to Brazil Saturday to attend the wedding of one of Wilma Yegerlehner Bell’s daughters. Tomorrow we are going to Champaign to have the Mercedes worked on. We won’t spend the night, since Dad has to work on Friday. Also we have dinner guests coming Friday night. The Chinese boy—William Yue and his father are coming. Also Dr. and Mrs. Miller. William is a brilliant student and is graduating from Purdue. He plans to continue his graduate studies at Cal Tech next fall. Since they can get the best of Chinese cooking when they return to Hong Kong, we are going to have steak and baked potatoes, etc. Also strawberries. Last year when Mr. Yue was here attending the Methodist Men’s meeting, we took him out to Morris Bryant and he had strawberries for dessert and said how much he liked them. One delicacy he doesn’t afford in H.K. They aren’t grown there. We have a 20 days tour for our stay in Japan. It will take us from Tokyo to Nikko and back, then from Tokyo to the extreme east end of Japan—Nagasaki. We will have probably a day and a half at Expo, at the end of our tour. We return to Osaka on the 9th and then on to Tokyo the 11th for our flight back on the 12th. I sent Dru and package. Was in Loebs yesterday and saw a cute little outfit for a small baby and thought she might like it. I didn’t remember her address and couldn’t remember Sully’s first name, so addressed it to Mrs. Dru Sullivan c/o Miss Elaine’s Beauty Salon, Rockport. I hope she gets it. One of the nurses who used to work in Dad’s office while her husband was going to Purdue sent us an announcement of the arrival of a daughter. She was born April 19th and weighed 4 lbs. 8½ ozs. I didn’t think much about that weight at the time, but one of the nurses at the health center received a letter from the mother recently and she said the baby has a cleft palate and a deformed foot, and had been born prematurely. 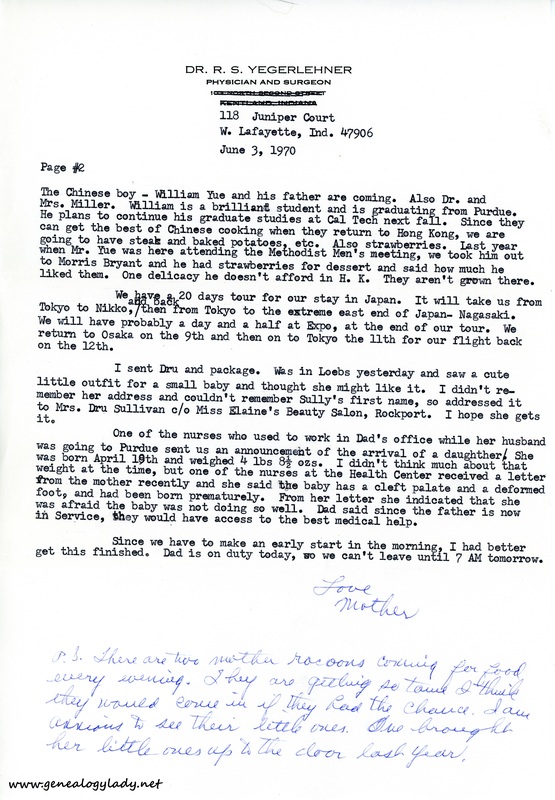 From her letter she indicated that she was afraid the baby was not doing so well. Dad said since the father is now in Service, they would have access to the best medical help. Since we have to make an early start in the morning, I had better get this finished. Dad is on duty today, so we can’t leave until 7:00 AM tomorrow. P.S. There are two mother raccoons coming for food every evening. They are getting so tame I think they would come in if they had the chance. I am anxious to see their little ones. One brought her little ones up to the door last year. 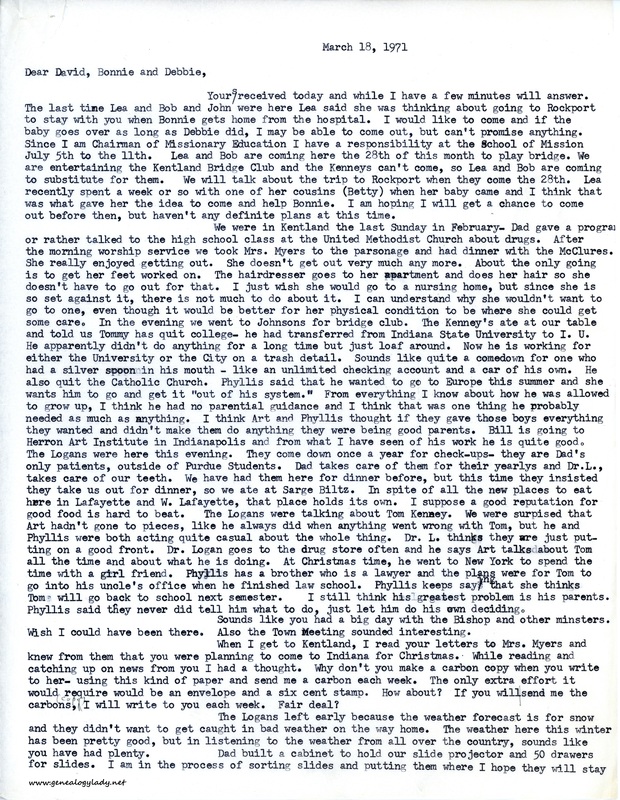 This entry was posted in Genealogy, Yegerlehner and tagged 1970, David A. Yegerlehner, genealogy, Gladys R. (Foster) Yegerlehner, Indiana, Lafayette, Margaret Zell, Methodist Church, Roscoe S. Yegerlehner, Ruth M. Myers, William Yue, Wilma Yegerlehner on September 5, 2017 by Deborah Sweeney.